pie – What's Cookin' @ Special Collections?! From: Rundell, Maria Eliza Keelby. A New System of Domestic Cookery: Formed Upon Principles of Economy. London: John Murray, 1816. Full text available online: https://digitalsc.lib.vt.edu/HFDBooks/TX715.R94_1816. From what else we do know, she worked as a cook, a nurse, and a wash-woman in Virginia and Tennessee. She owned a boarding-house, then a pastry shop before moving to Michigan, where she seems to have been a cook again at the time the book was published. 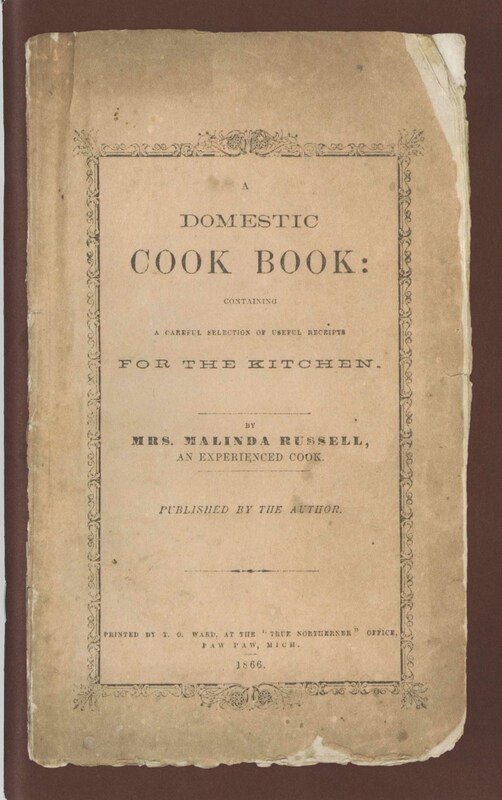 The original A Domestic Cook Book Containing a Careful Selection of Useful Receipts for the Kitchen was published in 1866. It was a 29 page pamphlet and very few copies still seem to exist. The one most well-known (if not the only one) is in the Janice Bluestein Longone Culinary Archive at the University of Michigan Special Collections. In 2007, they printed a small run of facsimiles, a copy of which we acquired not long after. Although the original item is out of copyright, the 2007 facsimile is not. As a result, I’m not posting images from the item itself, though I have included the front and back covers, and I’ll share some quotes below. Three tablespoons yeast, two do. butter, two do. sugar, two eggs, flour to make thick as cake. Let it rise six hours; bake quick. Scald and rub the peaches; stew until done; season with sugar to your taste. Paste your pans, put in the fruit, dropping small pieces of butter over it; cover with paste and bake. When done, float the pie with the syrup from the fruit. Boil in water with a little salt until done, then drain off the water, and turn over the fish rich cream, butter, pepper, and a little flour, and simmer slowly. I’m trying to keep my post from being too lengthy (too late, I know! ), but for a women with only one publication there was a LOT to say for this week’s profile. Still, I do want to add a final side note or two. First, despite the dearth of information about Malinda Russell, she is no secret in the culinary world. You’ll find her and her book as the subject of news articles, blog posts, and culinary research, if you take a moment to search for her. 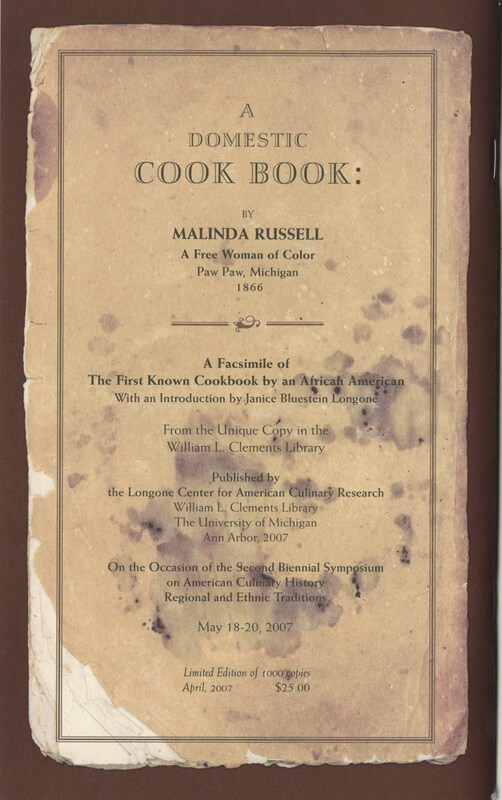 Second, to date, A Domestic Cook Book Containing a Careful Selection of Useful Receipts for the Kitchen, is the first known cookbook by an African-American, woman or man, in the United States. Robert Roberts’ The House Servant’s Directory is the first book published by an African-American in 1827 and in 1848, Tunis Campbell published Hotel Keepers, Head Waiters and Housekeepers’ Guide. Malinda Russell’s book remains in good company, when it comes to African-American publishing history. And, perhaps more importantly, she helped paved the way for the the next 149 years of African-American cookbook authors. Join us again next week for our final Women’s History Month profile of 2015. We’ll look at some of the works of food author M. F. K. Fisher. …Although the idea of cooking with a camel in one’s kitchen (not as an ingredient, but as a helper) is worth a giggle. Rather, our feature this week is from the Hills Brothers Co. of New York. Dromedary was the label of a variety of products, includes dates, figs, coconut, fruit butters, and tapioca. This particular cookbook comes from 1914. At 100 years old, it needs a moment in the spotlight.